As spring finally arrives in New York, motivation to get outside has escalated and the topic of where and how to walk in New York has become an increasingly popular topic. This past weekend we had the pleasure of leading two walks through the streets of New York, with a particularly geologic focus. The artist-led walking tours were offered through MoMA, and entitled, Uncovering Deep Time in Midtown: A Walking Tour. The walks took off from and updated our 2011 project, Geologic City. Our two groups were invited to experience and consider geologic forces and flows that give form and foundation to New York City — and then ultimately to consider the deep futures that the city, as a geologic force in its own right, is now setting up. We asked walkers to get curious with us about how imagining deep time might assist city dwellers to inhabit and creatively navigate current planetary changes underway. On April 24th, we set out with a group of students from Columbia University, most of whom were enrolled in a provocatively titled Anthropology course: “Ecocriticism for the End Times.” This group needed little introduction to the topic of the Anthropocene and related ideas, and was particularly open to discussing the geologic impact humans are having on the planet, as well as the cultural and biological impacts that we humans are experiencing in return. They readily activated our Anthropocene Viewer. On Saturday, our public tour began in a MoMA classroom with a brief introduction to geologic time (and the considerations of the Anthropocene) before heading out. From there, we endeavored to see if we could, at least for four short blocks, use various “aesthetic prostheses” to assist our brains in their efforts to grasp what some say is ungraspable for humans: deep time. The images, poetic language, and devices we used invited us to take a break from our habitual ways of experiencing the City. For this segment of the walk, we would instead try and experience our familiar urban environment as newly filled with materials that are, in fact, “time travelers” delivered by geologic history into the present, where they populate and animate our contemporary world. When we arrived at 50th Street and 5th Avenue, we paused beside the LEGO® store display window. We used magnifying glasses to inspect tiny bryozoan fossils that what make up the 350 million year old Indiana Limestone cladding on the sides of the building in Rockefeller Center. We then turned to face the tower of 30 Rockefeller Center, and took note of the uncanny, striking resemblance between the fossilized, lattice-like structures that colonies of Bryozoa built 350 million years ago, and the structure of the iconic NYC building that is 79 Rockefeller Center. The “windows” in the fossilized lattice are where the soft-bodied Bryozoa lived, suspended in comfortable air bubbles — not unlike the workers in offices behind the windows of The Rock. We then gave our walkers a chance to pause, sketch, write, and consider the force of geologic time that has created and shaped the materials that afford our everyday life in the City. As we walked to our next site, we attempted to view taxi cabs as “geology in motion.” Taxis are both fueled by and coated in primordial bodies of the Devonian, Permian and Cretaceous. The car paint color known as “taxi yellow” is manufactured out of oil by DuPont. Its color code is M6284. The crude oil used to cover and propel NYC’s taxies is the transformed remains of marine animals and plants covered by layers of silt and sand, then subjected to immense forces of heat, pressure and time. Along the way, we used the concept of Pre-Earthian to ponder human entanglement with deep time. Pre-Earthian materials (elements such as iron) formed during cosmic events that pre-date our planet. Today we see them manifested in urban human affordances such as manhole covers which were scattered in abundance across the streets around Rockefeller Center. And our everyday links to Pre-Earthian iron extends far beyond — to the iron core of our planet which gives us our magnetic poles — to the blood coursing through our bodies as we walked. Back at the MoMA, we had a short break in the Sculpture Garden. Here, we could experience first hand how humans transform geologic materials into art. Picasso and Rodin have been turned iron into bronze sculptures of animals and historic figures. And as we stood beside the Garden’s pleasant pond and fountain, we noted the monumental urban infrastructure known as the Catskill Mountains, which use gravity to send over 1 billion gallons of fresh and clean water to the City each day. Walkers stopped in the Garden to sketch and consider that, not only is the water displayed in the pools and filling our drinking bottles arriving here all the way from Upstate New York — it is a geologic material in its own right – as old as the Earth itself. As we left the MoMA, we shifted focus to geologic futures in the making. 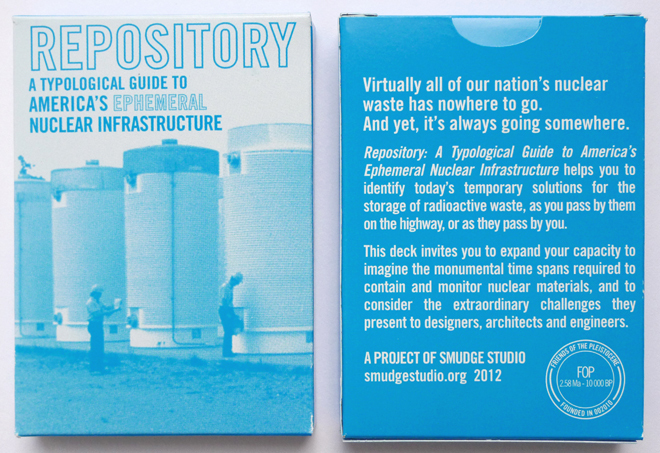 We passed out portable “Anthropocene Viewers” (direct link to pdf) to the walkers. The Viewer invites users to experience their surroundings through the frame of the qualitatively new geologic epoch we now live in – one shaped by human impacts on planetary systems that are now acting back upon us. We headed north on 6th Avenue to Central Park looking for Anthropocene-inflected realities along the way. In addition to humans, we documented chemically enhanced “fresh” flowers, NYC sightseeing buses displaying huge advertisements for vacations in the Caribbean, concrete sidewalks, urban density, global brands, foods imported from the other side of the world. We never tire of this paragraph and the wonder it incites. There’s an incredible disjunct between the geologic imaginary of this piece and the urban reality that lives and breathes around the steps in 2015. What geologic futures are we in the midst of ushering into reality? What geologic futures exceed us? What evidence of the Anthropocene can be sensed here? From within the park, the distracting din of the City is a bit more remote. Planes still pass over overhead, tourists still stroll en masse, surrounding buildings still loom. But there is a bit more space to actually take it all in. Standing atop the schist, we make contact with geology that signals the raw forces of geologic time. Walkers took a pause to inspect the groves carved into the schist by massive glaciers and try to picture, in the place of skyscrapers, the 1000 foot height of the ice that once towered over this spot. At this last destination, we unfurled a banner version of our Geologic Time Scale. Unlike the official geologic timescale— ours does not end with the present as culmination. Instead, we locate the present as the middle of geologic time on Earth. Neither beginning nor end, the present is where geologic and human forces are in the midst of unfolding and enfolding. The right side of the banner represents past geologic events, the left depicts how the materials forged by those events are being enculturated by human activity in the present. Our walks last weekend, and geologic viewer’s text and graphic design, suggest that all geologic time is contemporary; the materialities of every previous geologic epoch flow into the present-as-middle and give form to our daily lives. Here, these materials are continuously remixed by geologic forces and enculturated by human design as products, limits and affordances — with consequences that are geologic in effect. *special thanks to Alison Burstein and Sheetal Prajapati at MoMA.